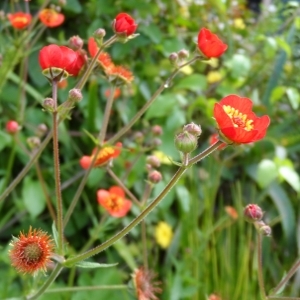 top left: Geum magellanicum in its original form is bright and airy at the same time, Duboce Triangle. top right: a late summer trio of perennial helianthus and two edibles- parsley and chia, Duboce Park. above: dark aeoniums rise above a base of low-water succulents, libertia and poppies. Ashbury Heights. great design follows... it makes the difference between a garden vibrant with life and a yard decorated with plants. My aim is to bring nature to people, rather than bringing the indoors outside, a trend dominant in too many garden magazines and make-over shows. My emphasis will always be thoughtful and enjoyable plantings, with base guidelines being aesthetics, utility, the customer's pereferences, and compatibility beyond the garden borders. Aesthetics: the single word to best describe my style is 'natural'. Even though every garden is a construct, I try to keep the contrived factor as low as possible. That means taking my cues from nature when it comes to placement and species choice, and avoiding straight rows and garish hybrids (you'll find more about my plant choices below). While more designers are using better choices of plants, too often the outcome looks like it was fork lifted from a shopping mall. That being said, the appropriate frame will compliment as well as contain the natural. This is especially important for those of us with small plots. The right amount of structure will gently anchor the charming spontaneity and wildness of informal gardens. Utility: a beautifully functional garden addresses the various duties we assign to it, such as providing privacy, flowers, food, aromatherapy, habitat enrichment, etc. When we follow nature's example, and work with the site at hand, our choices not only look well together, but grow well together. Customer's preferences: here's where it starts to get exciting, as it puts the 'together' in Garden Together. Collaboration can result in something better than either of us imagined, launching ideas we hadn't known we'd want to explore. To get the gears rolling, I like to ask each customer what they want to 'feel' when they see their garden. Compatibility: how does your garden fit with your home? How does it relate to the areas beyond its borders? How does it impact the environment? How much time do you spend with your garden? All good questions, because the influence of your garden spills beyond the back fence. all or part... whether you need a plan from scratch, or just want an area updated, I'll provide you with an assessment and a plan. Depending on the size and factors of the project, I can usually do the installation myself. If the work requires a contractor, I like to meet with the contractor to make sure our ideas meet expectations and work well. criteria for choosing plants: our climate, plus developments in horticulture, have made for a huge selection of plant material, but just because we can grow something, doesn't mean we should. I still see noxious weeds marketed in big box store 'garden centers', whiffing distance away from shelves of yard chemicals. My hope is to stimulate and expand your ideas of what a natural, water-wise garden can be.